Setting right what has been spoiled by the father. Tolerating what has been spoiled by the father. In continuing one sees humiliation. There will be a little remorse. No great blame. Setting right what has been spoiled by the mother. One must not be too persevering. This refers to mistakes that as a result of weakness have brought about decay-hence the symbol, "what has been spoiled by the mother. " In setting things right in such a case, a certain gentle consideration is called for. In order not to wound, one should not attempt to proceed too drastically. No blame rests upon the departed father. Danger. In the end good fortune. The Chinese character Gu 蛊 represents a bowl in whose contents worms are breeding. This means decay. It is come about because the gentle indifference in the lower trigram has come together with the rigid inertia of the upper, and the result is stagnation. Since this implies guilt, the conditions embody a demand for removal of the cause. Hence the meaning of the hexagram is not simply "what has been spoiled" but "work on what has been spoiled". When one follows others with pleasure, there are certain to be undertakings. Hence there follows the hexagram of Work on what has been spoiled. Work on what has been spoiled means undertakings. Work on what has been spoiled. Afterward there is order. The structure of the hexagram is not favorable. The heavy Gen is above; below is the gentle, listless Xun, the eldest daughter, who is occupied with the youngest son. But this stagnation is not permanent or unalterable. The nuclear trigrams show another trend. Zhen comes forth from Dui; both tend upward in movement and undertake the work of improvement energetically and joyously. This hexagram is the inverse of the preceding one. Before the starting point, three days. After the starting point, three days. What has been spoiled through man's fault can be made good again through man's work. It is not immutable fate, as in the time of Standstill, that has caused the state of corruption, but rather the abuse of human freedom. Work toward improving conditions promises well, because it accords the possibilities of the time. We must not recoil from work and danger - symbolized by crossing of the great water - but must take hold energetically. Success depends, however, on proper deliberation. This is expressed by the lines, "Before the starting point, three days. After the starting point, three days." We must first know the cause of corruption before we can do away with them; hence it is necessary to be cautious during the time before the start. Then we must see to it that the new way is safely entered upon, so that a relapse may be avoided; therefore we must pay attention to the time after the start. Decisiveness and energy must take the place of inertia and indifference that have led to decay, in order that the ending may be followed by a new beginning. Work on what has been spoiled. The firm is above and the yielding below; gentle and standing still - that which has been spoiled. “Work on what has been spoiled has supreme success,” and order comes into the world. “It furthers one to cross the great water.” On going one will have things to do. “Before the starting point, three days. After the starting point, three days.” That a new beginning follows every ending, is the course of heaven. The name of the hexagram is explained in its structure and in the attributes of the trigrams. The preceding hexagram is here reversed: the strong, upward-striving force is above, and the weak, sinking force is below. In this way the movements diverge, and relationships are lacking. The attributes of the two trigrams are inner weakness, gentle, irresolute drifting, and, on the outside, inaction. This leads to spoiling. At the same time, however, something thus spoiled imposes the task of working on it, with expectation of success. Through work on what has been spoiled the world is set in order once more. But something must be undertaken. Crossing of the great water is suggested by the lower trigram, which means wood (hence boat) and wind (hence progress), and by the lower nuclear trigram Dui, lake. 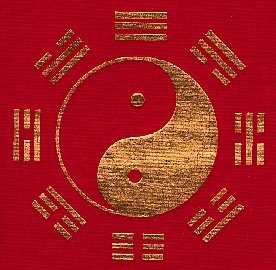 The phrase “before the starting point,” rendered literally, means “before the sign jia.” The trigram Zhen, in the east, means spring and love, and the cyclic sign Chia (with I) is next to it. Chia is the “starting point.” Before the three spring months, whose days taken together are called jia (and yi), lies winter; here the things of the past come to an end. After the spring months comes summer; from spring to summer is the new beginning. The words, “Before the sign jia, three days. After the sign jia, three days,” are thus explained by the words of the commentary: “That a new beginning follows every ending, is the course of heaven.” Since inner conditions are the theme of this hexagram, that is, work on what has been spoiled by the parents, love must prevail and extend over both the beginning and the end (cf. hexagram 57, Xun, the Gentle). 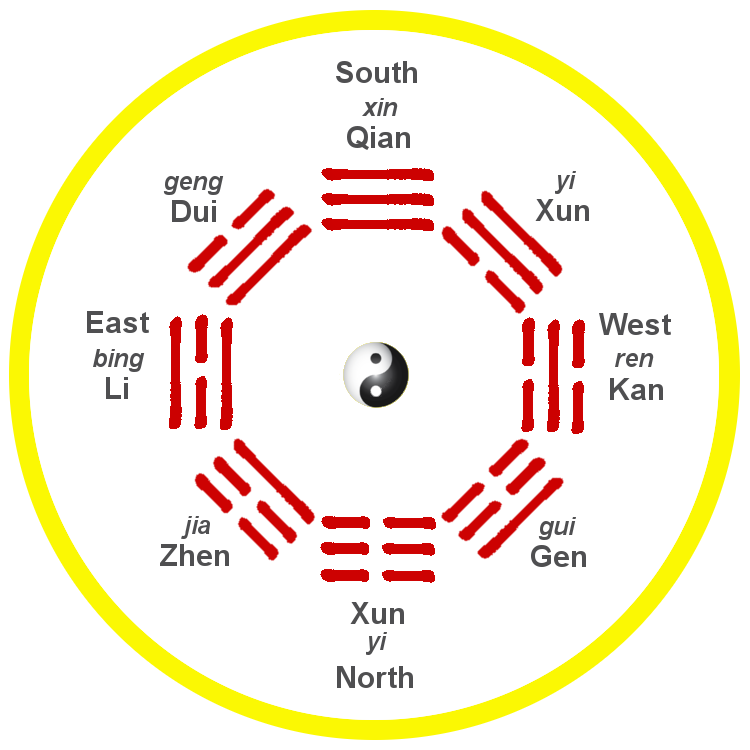 Another explanation is suggested by the order of the trigrams in the Inner-World Arrangement as depicted here. The starting point (jia) is Zhen. Going three trigrams back from this, we come to the trigram Qian, the Creative; going three trigrams forward we come to Kun, the Receptive. Now Qian and Kun are the father and mother, and the hexagram refers to work on what has been spoiled by these two. When the wind blow s slow on the mountain, it is thrown back and spoils the vegetation. This contains a challenge to improvement. It is the same with debasing attitudes and fashions; they corrupt human society. His methods likewise must be derived from the two trigrams, but in such a way that their effects unfold in orderly sequence. The superior must first remove stagnation by stirring up public opinion, as the wind stirs up everything, and must strengthen and tranquilize the character of the people, as the mountain gives tranquillity and nourishment to all that grows in its vicinity.